If you have a little locomotive lover in your life, then these reviews of some of the best train tables and sets will come in handy. The truth is, there is a lot to be said on the subject. Toy trains come in all shapes and sizes, with different styles, art and brands to choose from. Whether you know a little or you know a lot, these reviews will help you make an informed decision. When considering a train table for the child in your life, the first question you need to ask is whether or not you want to purchase independently or if you need to have a set that is going to complement the table that you are choosing. An independent table is one that comes on it’s own, or comes with a train set that is made by the same company. These tables are designed to be a complete kit and often work as starter sets for kids that are just getting into trains. They are sometimes the easier choice, because you get a table, you get a train, and you are ready to go. However, you do want to be sure that your independent table is also compatible with other brands that you may be interested in purchasing later down the line. For example, Thomas train tables are quite popular. However, not every brand of table is going to be compatible with those sets. There is a very nice and probably the most popular pick for Thomas lovers, the standard Thomas table. But, what if you want versatility or can’t afford it? There are other choices out there, but you need to do your homework. Additionally, if you already have cars from another brand in mind that you will also want to check compatibility between the toys and the track or table. Don’t feel pressured into purchasing a table or sticking to one brand. There are a number of good brands that are well-known for creativity, longevity and construction such as Brio, Fisher-Price and Chuggington… just to name a few. With these brands, they often offer tables that come with a full train set or that are designed to work with their sets. The plus to this is that you know that future purchases will fit on the table, and of course, the trains sold with the table, will also fit and be a good match. The KidKraft Waterfall Mountain Train Set and Table is a huge children’s play table, thats kid-sized, for hours of creative play for young minds. It includes a generous composite wood table with cafe rounded corners and a 1 ½ inch lip to keep toys on the table. 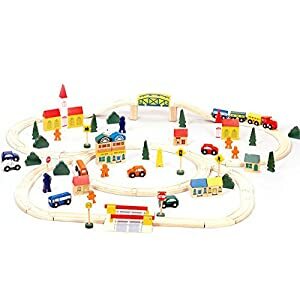 Also included are 120 solid plastic pieces including a mountain with tunnels, several twisting bridges, and an airport for hundreds of combinations and thousands of hours of fun. With its large size it can accommodate multiple children playing at once. It also so has three plastic bins included for easy clean up that fit under the table. Huge play set, big enough for multiple kids at once. Included bins for storage of pieces. 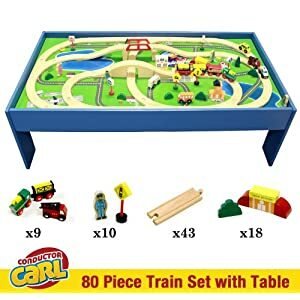 The Conductor Carl 80 Piece Train Table and Playboard Set is a colorful wooden toy train set and a great gift for young children that will want to grow with the toy. Made of beautifully painted wooden pieces, it engages young children for hours of fun. The set itself comes with 10 people or signs, 9 vehicles, 43 track sections, and 18 buildings, trees or shrub pieces. There is enough to work with to create a creative track and many design options. With classic colors that match standard train décor, this is a winning choice for simplicity and value. All track pieces are of single piece design so that they fit snugly together so your trains stay on the track. The Step2 Deluxe Canyon Road Train & Track Table is sturdily designed for giving many hours of fun to any young child. Its made in the USA out of scratch resistant plastic in one solid piece. Comes with a handy lid double sided lid so that it can convert into a play table with inset storage. The lid is a clean white so that it can blend in with any decor It also includes a colorful 3-piece train. This item is especially easy to clean and a good choice for children that are younger or that tend to be rough on their toys. 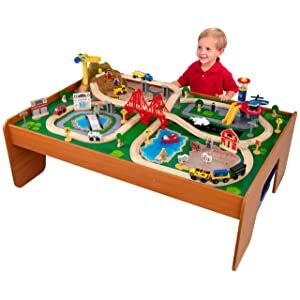 The KidKraft Ride Around Train Set and Table is a huge tabletop play space that is an ideal toy for any child or group of children. 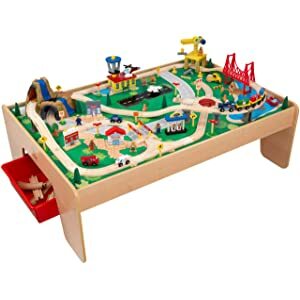 There is enough room for multiple play Including over 100 colorful pieces including an airport with helicopter, hospital with ambulance, train rails with four multi-car trains and a construction site with bulldozers and cranes to give kids a wide variety of engaging activities to keep them entertained for hundreds of hours. Built from solid wood and beautifully hand painted in the USA, its scratch free and easy to clean construction ensures that it can endure years of enjoyment. While train sets have changed over the years, there are still many standards that remain true. The item you buy could very well be the train that set a young mind towards engineering, travel or simply a lifelong love of locomotives. For many, a first train set is more complex than simply picking out a toy. For starters, a decent one is going to hopefully last for years to come. Wooden train sets are recreationally the popular choice, especially when introducing children to tracks, cars and engines. Metal and die cast trains are popular choices as well, however can be quite a bit more expensive. For recreational play, wood and trains with a plastic and wood combination are generally the popular choice. Not all train toys are created equal. Often, it is easy to tell what age range that a toy train set for children is designed for. However, keep in mind that trains are fun for all ages and there are small parts and magnets that can be a hazard for children that like to put things in their mouth. There is a train set for every age, but here are a few tips in order to make your child’s train set experience more enjoyable. Buying the right set from the get go is also an excellent way to get more for your money in the long run. Plastic tracks and trains are ideal for toddlers and younger children. However, as they grow they will probably want something more sturdy later on. 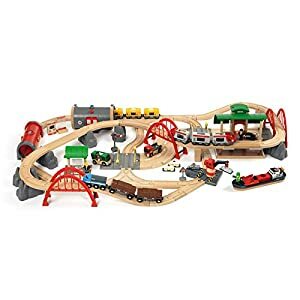 Consider Fisher-Price for a starter set for younger kids and then work up to Thomas or Brio sets that have both wood and plastic as they get older. Tracks that come apart or lift can be frustrating for the 3 and under crowd. Often, they don’t have the dexterity to put the track together and it can make the experience frustrating. Make sure to pick up some train clips to keep the railways tight. Looking for a set that will grow with your child? Consider purchasing a larger set but not giving them all of the parts right away. This way, even if pieces are lost, you don’t have to go out and purchase a whole new set. The Melissa & Doug Deluxe Wooden Railway Set has everything a child needs for hours of railway fun. The brand is popular for making innovative and engaging wooden toys and this train set does not disappoint. It includes over 120 pieces crafted solid and colored with kid safe lead free paints that will help to ensure long term use. The pieces fit snugly together but can be problematic when used on a carpet or non-solid surface. Recommended for ages 3 and up. If you are looking for a kids’ train with all the bells and whistles, then the Brio Deluxe Railway Set is the right choice. No, it really makes noise. With real lights and sounds, this kit is engaging and gets extra points for having it all. Together, there are 87 individual parts, including tracks, vehicles and city scape toys. Mostly made of solid wood construction, there are pieces which are made of plastic that are designed to enhance the overall design. Brio is known for their charm and creativity and this set delivers on both. The elevator works and the people can even be placed sitting inside the train. The KidKraft Farm Train Set is another. This huge play set includes 75 individual pieces with detailed design and unique farm shapes. There is diversity to this set and the artwork sets it apart from other models. There is quite a bit to keep kids entertained for hours, including a long winding track, molded mountain with a tunnel going through it, a large windmill, and many brightly colored farm figurines to give kids a wide variety of engaging activities. The difference with this one, versus other wooden train sets is the incorporation of wood and vinyl detail. In addition to cute farm stock, there is also a truck and train parts. Built solidly, the construction of this toy is both plastic and wood. It its scratch free and easy to clean construction ensures that it can endure years of enjoyment. 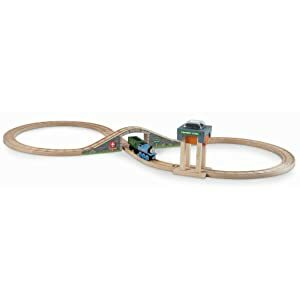 This toy will fit with most Thomas the Train wooden toy varieties, however there have been some complaints that the railway isn’t always uniform and so there can be compatibility issues with some items. The fit for the trains are not always on par, so other brands may be wobbly or not sit right on these tracks. Large play set, big enough for multiple kids at once. 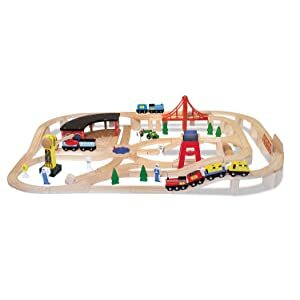 If you already have a table, then the Fisher Price Thomas Wooden Railway is an ideal choice to complement a current track or to establish as your permanent track. The train track has a length of 42.5 inches and is 17.5 inches at the widest point. This will fit nicely on most popular brand tables. It is compatible with most popular brand tracks as well such as Brio and Chuggington. The cars are made of plastic, which makes them easier to clean. They are uniform and what you would expect from a Thomas set, with his bright blue engine and smiling face. It also includes one puller train car that has coal in it. The coal can be taken out of the car as well. The track itself is a simple starting set with a standard figure 8 model and run through bridge. 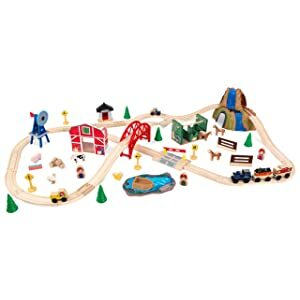 This item can be combined with other Fisher-Price Thomas the Train Wooden Railway items to make a more complete set. Lightweight – less than 5 lbs! This is a solid wood train set that comes with 100 pieces, enabling loads of locomotive fun and imaginative play. It includes a Conductor Carl Engine Car, 34 assorted track parts, 12 assorted vehicles, 15 people or signs and 39 building, bush and tree options. Overall, it is versatile and there are many ways to put the track together and alternate town settings that can be created. This set is ecologically minded and safe for children as it is 100% compliant with current CPSIA regulations. This item does not contain lead or phthalates. Unfortunately, the sizing can vary when you make certain track creations. It is possible, but it also can be hard to plan because of all of the possible combinations, if you plan on gluing or making this a permanent track. Not all configurations will fit on a standard train table. While it can still be used, this is more of a travel or play train set then something that would be stationary for long term tabletop usage. Purchasing a new train for a child can be an exciting time, but it can also be quite an investment. Not all sets are cheap and most are designed to be played with for years to come. Train collectors often remember their first train and for this reason, the toy industry seems to make quality toys in this category partially for that purpose. However, there are a few things to keep in mind when you are purchasing train toys and products. The tracks of wood are crafted to fit together like puzzle pieces. Most popular brands have made it so that they can be compatible with other companies. However, there are some that have their own unique shaping and for this reason it is important to note compatibility before you make a purchase. Another important thing to remember is that just because a brand is the same, this does not always make the items interchangeable or compatible. Wooden train sets are all going to be about the same length and width when set in standard formation. That is, when they are set up in the ideal or common fashion, they generally will fit on tabletops that are designed for trains. However, if you already have a tabletop train setup, make sure to verify the maximum length and width before you buy. While most wooden train sets will come with interlocking wood pieces for the tracks, there is often metal, plastic or magnet on parts of the trains and there is a reason that they list age limits. Be mindful of age limits that are set on the labels for train sets or tables. Those items that recommend for over 3 years old often have magnets that can present as a choking hazard and there can be integral parts of some that are not ideal for younger children. As a rule of thumb, opt for simple wooden or plastic options for toddlers and children under 3. They are going to be the ideal choice to introduce a boy or girl to trains and track crafting with the least amount of hazards. So… Which train is right for you? So as you can see there can be a lot of factors when choosing which train is right for the budding conductor in your life. Size, materials, brand and construction should all be factors in your decision. So just remember what we have shown you in our practical guide and you will find the right train in no time. This was very helpful for picking out a train for my daughter! Thank you! Great information on picking out a train set!!! Last Christmas I went with the toys r us table and it didn’t hold up to my rough 2 year old. This year I went with the Thomas table and wooden railway sets. I’m hoping now that he’s 3 years old it holds up better. Thanks for the info in this article! Yes, indeed they don’t make the train sets like they used to be. Thomas table still seems very sturdy to me, for the train set, you could try Melissa & Dough or Chuggintons, their price is ok, and stand strong against my boy rough play. I just love this blog post, It is very helpful specially to those who are looking for train sets. There are many choices of train sets that can help you find what’s best for your kids. Glad you like it, Maria! Thanks so much!